If for some reason, you haven’t looked at @trianglemancsd ‘s Which One Doesn’t Belong shapes book, check it out here. It is a great gateway into math talk, vocabulary, critical thinking- all those things we cherish in our classroom. Of course, my mind is always thinking of how I will take this gem back to my classroom and use it. This book can truly be used by any grade level, conversations can be that rich- although the time that is needed for each one should decrease. My first reaction was, “Why aren’t there also 3D shapes?” I asked Christopher if he had any plans on incorporating these and he didn’t at the moment. Kids live in an environment where 3D is the norm, and I think these same discussions (as well as new ones) can happen with the “more complicated” shapes. Of course, now I will be working to assemble pages of these types of problems together! Thanks @triannglemancsd! Thank you! Not ashamed to say my “Fan Girl” turns on for @Trianaglemancsd and his wisely winsome mathematical eye. 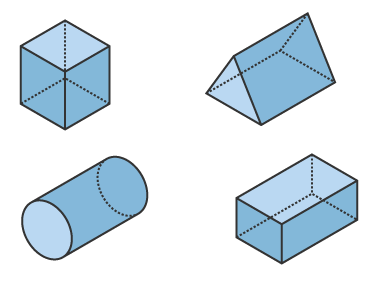 Your 3-D WODB will be used to kick off my upcoming lesson set on Volume. I also foresee returning to it as my fifth graders contemplate how/why things change when moving from calculating V for cubes and rectangular prisms to that of finding V for pyramids and cylinders.